From the Willliam de Morgan range. Beautifully printed design 14x14 inches on 20 inch square of 12 hpi canvas. Appleton wools, detailed instructions and needles included. From the Willliam Morris range ( does have a matching bell pull/tiback kit available). Beautifully printed design 15.5 x 15.5 inches on 20 inch square of 12 hpi canvas. Appleton tapestry wools for the design and crewel wool for the background, detailed instructions and needles included. From the Willliam Morris range. A graceful design of twining acanthus leaves and delicate flowers make a dramatic statement for this needlepoint kit. Beautifully printed design 16 x16 inches on 20 inch square of 12 hpi canvas. Appleton tapestry wools for the design and crewel wools for the background, detailed instructions and needles included. 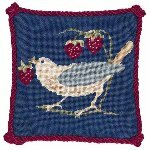 Lovely needlepoint miniature adapted from the popular William Morris design. Measures 6 inches square, printed on 18 HPI interlock canvas. Wools and instructions included. 15 x 14.5 inch design printed on 14 hpi tapestry canvas measuring 20 inches square . Instructions and Appleton's crewel wool list given but no wools supplied. Although listed as a bell pull this lovely flowing WILLIAM MORRIS design is illustrated as an elegant curtain tie back. The design is 38 x 6.5 inches printed on 7/8 hpi single interlock rug canvas measuring 44 x 15.5 inches. The kit includes all Appleton's wools, tapestry for the design and crewel for the background, and instructions There is also a cushion kit to match . We do also sell this rug canvas . 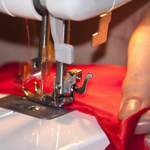 it is a great cotton weight .£21.60 /m 120 cm wide . Lovely miniature needlepoint adapted from a William Morris design. It measures 6 inches square, printed on 18 HPI interlock canvas. Wools included. Stitched on 14HPI mono deluxe canvas, printed design measures 11 x 14 inches on a 22x26 inch canvas. An unusual William Morris needlepoint kit from Beth Russell. 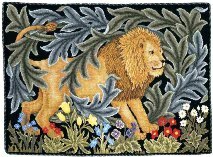 7.5 X 12.5 inch printed design on 18hpi 14 x 18 inch mono deluxe tapestry canvas,.Includes Appleton crewel wools , instructions, needles and a chart for lettering too ! A classic but fun design inspired by a William de Morgan original that makes into a beautiful cushion or footstool. 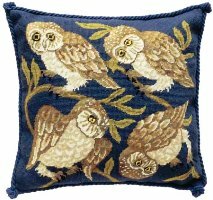 A wonderful design adapted from a William Morris tapestry that makes into a beautiful cushion or footstool. 16 x 20 inch design printed on 14 hpi single hole mono de luxe tapestry canvas measuring 22 x 26 inches. design 8 inches square printed on 12 hpi tapestry canvas 13 inches square . Instructions and wools included. design 8 inches square printed on 12 hpi tapestry canvas 13 inches square . From the William Morris Fruit collection. Instructions and wools included. Stitched on 18 HPI canvas, with all wools included. 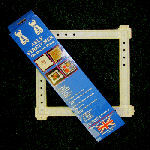 Design size is 15 cm x 15 cm. Canvas size 25 cm x 25 cm. A needlepoint miniature adapted from an original William Morris design. Stitched on 18 HPI canvas, with all wools included. 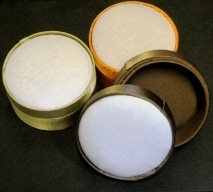 Design size is 15 cm x 15 cm . Canvas size 25 cm x 25 cm.